This next installment of the lecture series covers the latter part of the American colonial period and the period of Japanese occupation. After the complete pacification of the Filipinos through the Philippine-American War, the American colonialists continued the repression of the working class by co-opting the ruling classes and established the Commonwealth Government. But even though the armed resistance was suppressed, Filipinos continued to organize through labour unions and community associations which clamoured not only for workers’ rights but also for national liberation, and eventually formed a working class party. As the Second World War broke out, Japan invaded the Philippines and the United States retreated, leaving Filipinos to struggle against a new imperial force. *Attendance at previous lectures is not a pre-requisite. A recap of major points from the first two lectures will be provided. Presented in partnership with the Filipino Students’ Association of Toronto (FSAT). For more information, contact migranteON.youth@gmail.com or (647) 239-6553. Once again presented in collaboration with the Filipino Students Association of Toronto (FSAT). A whole day of activities on awareness-raising about Philippine history and culture and community engagement. A collaborative project of Migrante Ontario Youth, Philippine Advocacy Through Arts and Culture, Kapisanan Philippine Centre, Filipino Students’ Association of Toronto, Filipino Canadian Association of Ryerson. We are continuing the “Ka Bel” lecture series which started in the summer. The next topic will be the first half of the American period, 1898-1916- that covers the Philippine-American War and the Consolidation of US Rule in the Philippines. In this period, we’ll also see the beginnings of the Philippine trade union movement, and the role of the Philippine Independent Church in the liberation movement. Migrante Ontario Youth and the Filipino Students’ Association of Toronto (FSAT) are proud to present “The Birth of the Philippine Working Class and the Katipunan,” a lecture on Philippine history to be held on Saturday, July 5, 2008, 1-4pm at the Charbonnel Lounge, St. Michael’s College at the University of Toronto, 81 St. Mary Street (south of Charles St. West, west of Bay St.). July 7 marks the founding anniversary of the Kataas-taasan, Kagalang-galangang Katipunan ng mga Anak ng Bayan (Highest and Most Revered Association of the Children of the People). Founded in 1892, the Katipunan quickly became a nation-wide organization which would lead the Philippine Revolution of 1896 to end almost 400 years of Spanish colonial rule. The lecture, “The Birth of the Philippine Working Class and the Katipunan,” will focus on the period of Spanish colonialism and how economic policies at the time resulted in the emergence of the Philippine working class. The lecture will also look at the Katipunan as an organization initiated by workers and its role in the struggle for national liberation. The featured resource person at the lecture, Ricky Esguerra, is former instructor of Political Science a the University of the Philippines. He is currently on the executive committee of the Community Alliance for Social Justice, and member of the Philippine Solidarity Network. 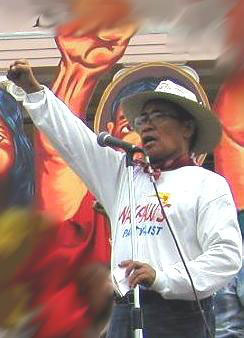 This lecture is the first of the Crispin “Ka Bel” Beltran Philippine History Lectures prepared by Migrante Ontario Youth in commemoration of the long-time labour leader turned congress representative, who passed away in May 2008 shortly after a visit to Canada. Two long-time activists, now members of Philippine Congress representing women and workers’ movements, are visiting Canada to call on the Canadian government to stop supporting the repressive and corrupt regime of President Gloria Macapagal-Arroyo. Under the guise of the war on terror, President Arroyo is waging a violent crackdown on people’s organizations and government critics. More than 800 social activists, human rights advocates, progressive politicians, journalist, lawyers and judges have been assassinated. The U.N. Special Rapporteur on extrajudicial killings, arbitrary and summary executions attributes many of the killings to the military. Massive protests demanding President Arroyo’s resignation amidst allegation of corruption bring to mind the 1986 People Power movement that ended the dictatorship of Ferdinand Marcos. 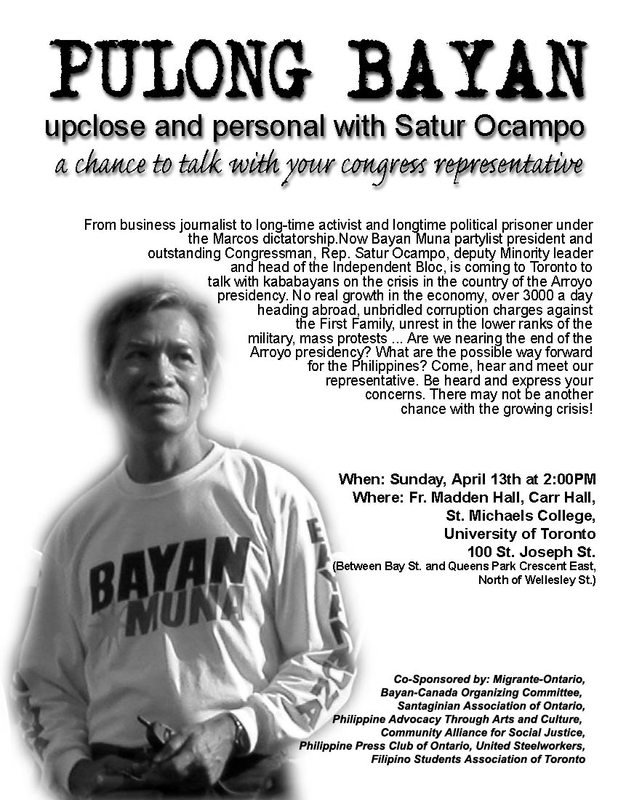 From business journalist to long-time activist and long-time political prisoner under the Marcos dictatorship… Now Bayan Muna partylist president and outstanding Congressman, Rep. Satur Ocampo — deputy minority leader and head of the Independent bloc — is coming to Toronto to talk with kababayans on the crisis in the country of the Arroyo presidency. No real growth in the economy, over 3,000 a day heading abroad, unbridled corruption charges against the First Family, unrest in the lower ranks of the military, mass protests… Are we nearing the end of the Arroyo presidency? What are the possible ways forward for the Philippines? Come, hear and meet our representative. Be heard and express your concerns. There may not be another chance with the growing crisis!